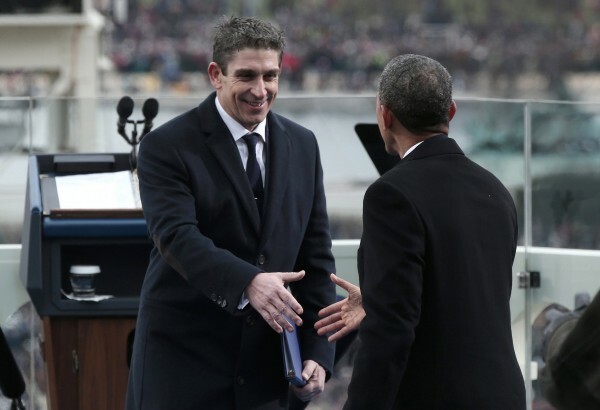 President Barack Obama (right) greets poet Richard Blanco after his reading at the presidential inauguration on the West Front of the Capitol in Washington, D.C., on Monday, Jan. 21, 2013. In celebration of their 10th anniversary in business, Left Banks Books in Belfast is welcoming poet Richard Blanco, novelist Lily King and other authors to read from their works during a weekend of special events. Blanco will speak and read his poetry at 5 p.m., Aug. 2, in the First Church of Belfast, across the street from the store, to accommodate more attendees. The visit by Blanco, who was President Barack Obama’s inaugural poet, comes on the heels of a reading by Ann Patchett in June, which attracted more than 300 visitors. Blanco will sign books in the store following the event. Blanco said he may read excerpts from his new memoir, set to be released in September, at the event in Belfast — though he said he is a bit nervous. Blanco, who has lived in Maine for six years, said he can relate to quieter town life because his family comes from a rural area in Cuba. The poet focuses much of his work around the ideas of home and where we find it. He said the places he lived usually don’t come into his work until years later. “Amazingly, Maine has already made it into my psyche and my poems,” Blanco said. Yarmouth-based writer, Lily King, also will read and sign books this weekend at Left Bank Books at 3 p.m. Sunday, Aug. 3. King’s novel, “Euphoria,” inspired by the life of anthropologist Margaret Mead, received a review on the front cover of the New York Times Book Review when it was released. The reading will be King’s second at Left Bank Books. This time, however, she’ll have the movie rights to her new book in the hands of director Michael Apted. “I’m so honored to be part of their 10th anniversary and to be on a list with such great writers,” King said. Nancy Hauswald, publicist for Left Bank Books said she and the store’s three owners have been sending letters to many writers, poets and novelists, congratulating them on awards and speaking engagements and keeping the dialogue open, hoping one day they’ll make a stop at Left Bank Books. This summer, their work paid off. This spring, Blanco agreed to a reading and will be making an appearance at the bookstore Saturday, Aug. 2. The last time he visited the bookstore he stayed for two hours, meeting all the staff there. It is bookstores, such as Left Bank Books, that help keep writing alive in Maine, according to Blanco. “It’s certainly part of it, especially in Maine where there are so many wonderful independent booksellers. They are the lifeline of the literary world here. So I do as much [readings] as I can in Maine,” he said. For King, Left Bank Books and other independent bookstores are part of a larger trend. “I think independent bookstores all over the country are really able to bring really good books that maybe aren’t the big blockbusters of the season and get them into peoples’ hands. They’re curating just a wonderful, eclectic group of books. It’s just a personal, wonderful thing to just find the right book for the right reader,” King said.